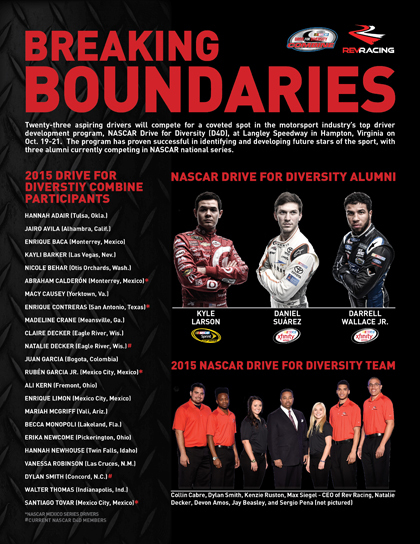 For its 5th consecutive year, the NASCAR Drive for Diversity (D4D) Combine will take place in Hampton. A NASCAR-sanctioned initiative, the success of the Drive for Diversity Combine is largely contributed to the support of its partners and year-round sponsors. D4D partner, Langley Speedway, will host the combine, drivers and officials on October 19th – October 21st. Langley Speedway is a NASCAR-sanctioned track that hosts more than fifty percent of Rev Racing’s Whelen All-American Series races throughout the year. The track currently hosts 11 divisions which alternate running during their Saturday night program: Late Models, Grand Stock, Modifieds, K&N Pro Series East, Legend Cars, Super Street, UCAR, Pro Six, Super Trucks, HRKC Pro Winged Champ Karts, Bandoleros, Enduros, and the Whelen Southern Modified Tour. In addition to the on-track performance evaluations that will take place at Langley Speedway, the participants will be evaluated on physical fitness conducted by pit crew coach Phil Horton at Hampton University. Rev Racing’s partnership with Hampton University has extended outside just the use of their facilities. Management at Rev Racing has worked year-round with students in the sports management program as well as the school of business at Hampton. Students and faculty have worked jointly with Rev Racing on research projects, strategies and distribution tactics of the team’s social media platform.